Hahaha this is spot on. I've been here for 16 months and ordering food is still a surprise. In Korea? Very interesting. Good thing the cold noodle soup is delicious! Um, cold noodle soup in Korean is naengmyun. I did not know that. This comic comes directly from my experience, so I must have said that! Great. 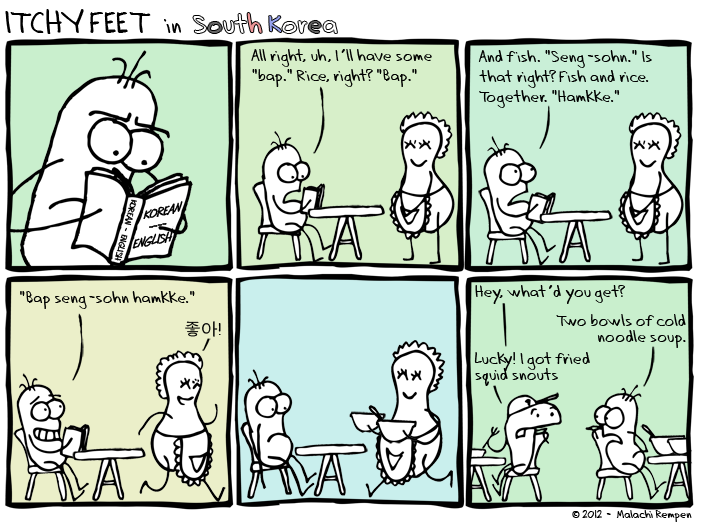 Haha, this comic reminds of a story of a South Korean taxi driver, who had one American passanger who asked the driver to take him to 'under apple(pronounced like 'mit-eh sa-gwa'),' when the true destination was US embassy(pronounced like 'mi deh-sa-gwan').